There’s something about apples that gets everyone very excited during the winter season — apple pie, applesauce and apple cider. While ciders are made wherever apples are grown, this fixation has become especially deep rooted in American culture. English settlers started the craze out of disappointment with the bitter crab apples the New World had to offer. They began importing their own apples seeds and thus the American orchards were born. Once the apple pies and apple butter had been made, the left over apples were pressed and stored in barrels to ferment. American cider makers have embraced colder months by releasing ciders packed with cranberries, spices and a big heaping of holiday cheer. 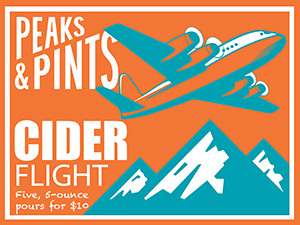 Curl up next to Peaks and Pints’ fireplace with our wine cider flight, Peaks and Pints Monday Cider Flight 12.3.18: Winter. California Cider Company is the first family owned cider in the US. 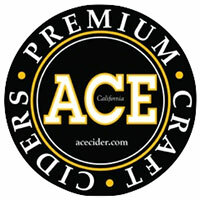 They have been making Ace Premium Craft Cider since 1993 in the beautiful Sebastopol area of Sonoma County California just north of San Francisco. Their new Winter Ginger cider is a dry cider with ginger. The ginger walks a balancing act — too much spice, or just enough? In the end, we think it’s just barely on the right side of the equation, in a way that appeals to the ginger-lovers in us, particularly because it doesn’t bog down in excessive heat. The corresponding cider is on the drier side, and contributes a firm, slightly tart fruitiness, but what you’re really drinking this one for is the excellent application of the ginger. Who doesn’t love glitter? It’s nearly impossible to get out of your cleavage after a night on the town, but it’s festive as hell. And now thanks to edible glitter, your digestive system can be as sparkly as your 1990s eye shadow palette. Due to prohibitively difficult nature of cleaning glitter out of brewing equipment, glitter cider may not be the next big mainstream trend, but it’s definitely gaining popularity. 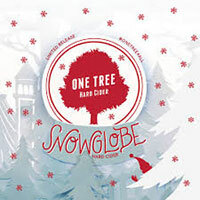 One Tree Hard Cider’s Snow Globe Cider is a delicious spiced cider with glitter. We recognize the clove and cinnamon, but the glitter seems like a handful rather than a full dance floor dump. 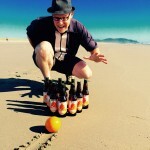 Seattle Cider Company is Seattle’s first cidery since prohibition, bridging the gap between wine and beer with flavorful, dry cider. Aged on cranberries from Starvation Alley, Washington’s first organic cranberry farm, Seattle Cider Cranberry Cider is a winter arrival offering a blend of fresh-pressed apples and cranberries. This berry-hued cider is completely dry, pleasantly tanic and the perfect combination of bright fruitiness and satisfying tartness. 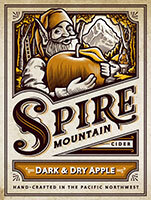 Alpenfire Cider is based in the seaport town of Port Townsend, Washington. They are a family run, certified organic, estate cidery and orchard planted in 2003. Their American artisan New England Style cider Tempest is an estate apple cider re-fermented with raisins and brown sugar then fermented for 4 weeks followed by 5 months in the tank then conditioned in the bottle before arriving at Peaks and Pints. Think English cider with notes of bittersweet apple, apple pomace, must, orange and leather with slightly higher sweetness and funk.